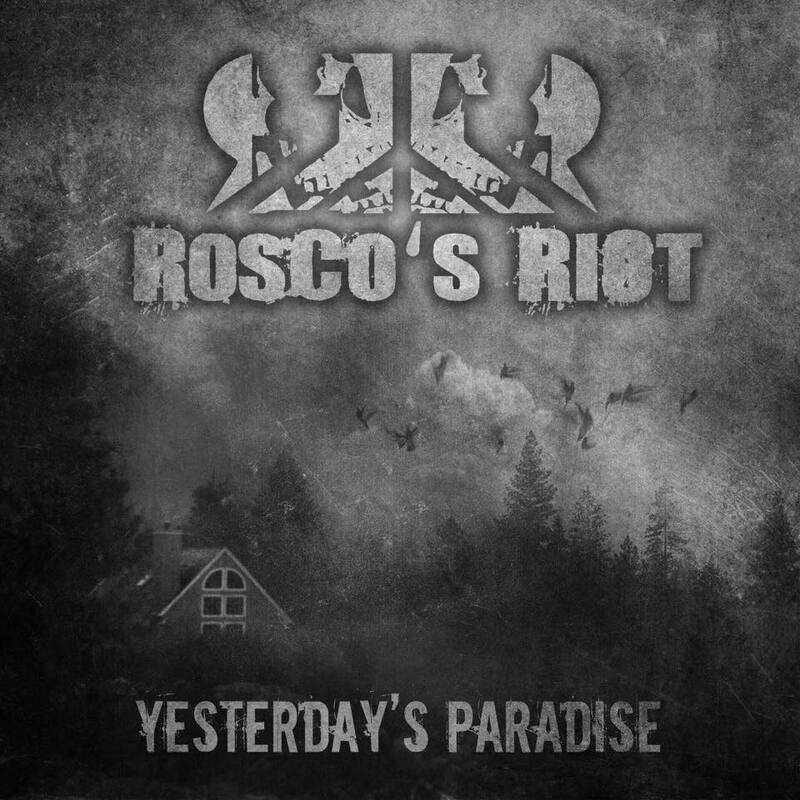 Released this year, on their own label, Rosco’s Riot present their new EP, ‘Yesterday’s Paradise’. Six tracks of chilled out rock, all the way from Ireland. Recorded and produced at Einstein Studios. Bound To Hell – Gentle acoustic intro, morphing into a full on metal section. A slight grungy sense to it, within the harder sound of accomplished rock. Those vocals fit right in, with their laid-back, yet evidently involved drawl and the twiddly melodic riffs are well placed. Just a great rocky song. War – Right into it, with rocked up pizzazz. No help needed in convincing anyone of their metal wares. Seasoned vocals, with a Bon Jovi-esque edge blitz their way through, easily, in sync with the accompaniments, exuding a heavy, yet light-hearted doom aspect. Only One – Slash-esque intro, with a notable sound of Andrew Stockdale’s ‘By The Sword’, before those Bon Jovi-esque vocals take the reins again, evoking imagery of westerns and dusty back roads in deep south America. A really classy feel permeates this and it’s one which enables instant ease and relaxation. Eventually, it moves into natural ‘Dead Or Alive’ sound, rounding it off into a perfect rock track. It’s very much alive with that true American essence – difficult to achieve as a non-American band, so big respect for that. Little Darling – Very cool guitar breakdown introing and launching straight into a neat riff and drum centred section, helped along by those intrinsically rocky vocals. A bigger sound grows out of those guitars and it’s a short, but sweet taster. Fate – Bass led intro, bringing it straight into a mid-paced number, with drive and energy pushing it along. Classic rock style vocals, of the kind that belong in ‘Classic Rock’ mag itself. An easy tempo and some truly fab riffs take it into respected metal territory. Catchy and cool. Yesterday’s Paradise – Controlled opening, coming in gradually, at a nice easy flowing pace. Very smooth, listenable, bluesy tone, with an experimental, yet perfect directionally diverted breakdown. Really fulsome track, with light doom aspects and plenty of bass. Speeding up again at the end, for those final riffs, it’s immediate and so cathartic. Overall – A refreshingly laid-back mix of blues, southern rock, classic rock and sleaze, with melody and a bass driven, doom edge. Sure to catch the attentions of all, from soft rock, to gritty hard rock and metal fans, it’s memorable, cathartic and easy on the ear. A seasoned sound, from deceptively young talents. Formed 1st May 2017, from ex-members of ‘The Siks’. 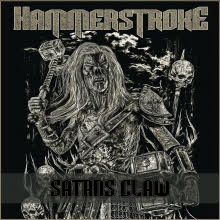 Based in Salzungen, Germany, born with the intention to create a traditional metal sound, with all that that involves, Hammerstroke are a heavy melodic thrash metal band. Composed of Thomas (DocRock) Kaufmann – lead guitar and currently, bass and Rene (Kursche) Kurschner – rhythm guitar. An old friend (Isy) from a past band completed the line-up, as bassist. June 2017 saw the beginnings of the EP. The trio produced the guitar sections at DocRock’s home studio. He also produced the rest, including the drums, lyrics and vocals, while René was responsible for the rhythm guitar, cover art and band promo. Isy then left, leaving DocRock and René as a 2-piece, who continue to work on creating new material, whilst pursuing a new drummer and bassist. The debut full-length album and live shows are in progress. ‘Satan’s Claw’, the debut EP, was released on February 15th, 2018, via DocRock Music Records. Now You Die – Eerie, mysterious music introing. Loud metal soon follows. A very doomy tone to those vocals, painting pictures of darkness and fear. Still metallic, in places and some yummy, spooky, yet melodic riffing complementing the lyrics. An aptly depicted tale of doom and haunting. Satan’s Claw – Speed riffing opens, with equally powered, fast drumming and frenzied vocals, setting the scene for more. In a blatantly heavy-metal style, this title track grows stronger, as it progresses, injecting an edgier vibe and real visual imagery into the tone. Climbing and descending, in all the right places, it’s vocals are grittier and more emblazoned and it ends on a rapidly falling riff. Just wish it was longer. Sweet Illusion – A much deeper, clearly doomier bass line intro’s, emphasising the tone of ‘S.I.’, immediately. Vocals following the sound and technique, they take it into lower, sleazier, but still doomy territory. Gorgeous, tuneful riffage embodies the title and the pace is steady, while the song itself is catchy, ending on a low bass hum. Easy to get into and down tuned, to a relaxing tone. Kali Yuga – Racing things back up again, with a speed themed riff opening and everything falling instantly into line. Very catchy sound, a more uplifting vibe and a great, fun loving melody. Filled with higher pitches, rhythmic bliss and obvious enjoyment. Exuberant, upbeat and massively infectious. It’s a hit. Depths Of Mind – Carefully crashing intro, like bringing a chandelier, cautiously to the floor, sending a controlled rain shower with it, in turn, sending a vibrant explosion of colours shooting off it, into the atmosphere. That sums up the vivid sound of ‘D.O.M’. Hugely riff centred, so much so, that it’s basically a riff fest, of the kind that comes from freestyle, fired up improvisation. I love it. Stayin’ Alive – Perfected, true heavy metal intro, making this Bee Gees’s classic into something I never thought possible. Enormous kudos and metal respect for that. Never before have I enjoyed this track so much, which in itself, speaks volumes. Creating a novel, catchy, metallic number, sure to attract fans in their droves, it’s got anthemic harmonies, colourful riff sections and a general feel-good air, proving the power and potential metal can bring to anything. It wins points for that alone. Hammerstroke – Sheer power, energy fuelled drive, taking the pace up to frenetic speeds. This here is what you call a flagship song. A mascot, even. Call it what you will, but however it’s termed, it’s an ace. Gravel edged vocals, crazed riffs and speeding drums, slotting right in. It may be brief, but it knocks the socks off most. One listen’ll chisel it into your memory forever. Overall – A faultless, versatile and energised performance, crackling with power and exuberance. Solid delivery, flexing the edges between doom and heavy-metal, speed and power and the vocal dexterity to suit each one. Even a wildcard, from a different genre altogether, expertly metallised and recreated. As if that wasn’t enough, the closing flagship track just made it. A wonder of metallic creation. For fans of doom, speed/power metal and heavy-metal, with alt, fantasy and gothic themes. 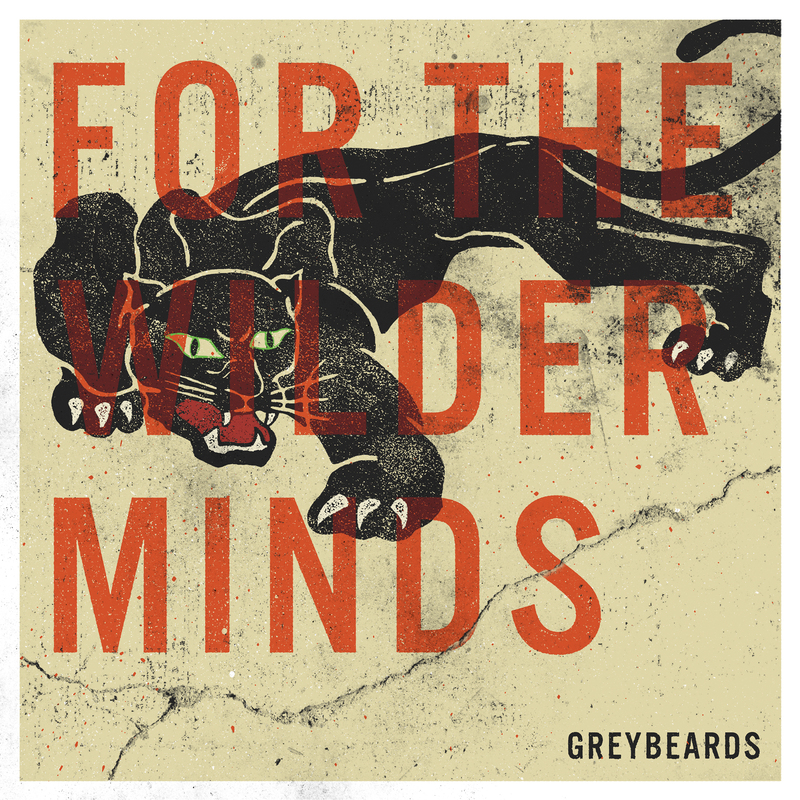 Greybeards are about to release their long-awaited 2nd album, ‘For The Wilder Minds’, via Attitude Recordings, on 4th May 2018. The guys from Gavle, Sweden, have created an album of great tracks, combining rock, alt and catchy heavy pop rock. The imaginative, tuneful catchiness is the greatest strength of the tracks on ‘FTWM’. Post-release, Greybeards are booked as special guests of Bonafide, on their UK tour in May. Recorded at Studio Sound Society and Sound Control Swede, in Gavle, Sweden, ‘FTWM’ was produced by Chips Kiesby (The Hellacopters, Crucified Barbara, Bonafide) and co-produced by Regina Wallmark. Strings on ‘Peace Of Mind’ were recorded and produced by Maria Gronlund, at Studio Strings. The concept of the intro track revolves around online identities and how they’re constructed and sustained, to the detriment of our own realities. Fast Asleep – Killer riff introing, pounding drums follow, alive, unhesitant vocals come next. Easy catchy flow to the melody, upbeat, happy vibes and a great modern feel to the overall sound. The ending’s just very slightly rushed and momentarily mistimed, between the bass and lead guitar, but generally, it’s got it all. Feel-good rhythms and sense to the whole thing and a summer soundtrack essence – what’s not to like? One In A Billion – Pleasant, gentle, tinkling intro, launching, from there, into a full on rocked up sound. Instant catch, showcasing natural old school vocals, in a newer, vibrant accompaniment. Better timed closing section and just a very punchy, uplifting song. Come Undone – Changing tack now, to a Placebo-esque vocal and more of a Brit rock sound. Decent mid-paced rhythm, consistently maintained and a rocky vibe. A bit more of a laid-back arrangement, but again, very listenable. Insane – Banging drum intro, good racy beat, confidently delivered, enjoyably voluble. A very fun track, with plentiful riffage and cheerful sounding backing vocals, if slightly cacophonous, at times. Real tightness deployed in that rhythm, whilst countering it with looser sections and an almost punky, freestyle vocal. Ultimately, it’s a great, sunny listen and only a killjoy would say otherwise. Beautiful Things – Ace, plucky intro, immediate and snazzy, again, bringing that Placebo-esque vocal back again. Similar rhythm, even. Well timed intro of backing singers and appealing title theme. More poppy in its general sound and essence, but passionately performed and difficult to fault. Free – Instant, cracklingly powerful drum intro. Right into it, with very appealing lyrics and rockier rhythm. The fast beat alone seems to pull you in and drag you along with it. Really bright, colourful feeling and some great twiddly riffage. There’s a strength to this, which stands out a mile and so far, this has got to be the catchiest track. Well ended, with an air of skidding into the ending, after a fun, enthralling ride. Just how it should be. You Struck Me – Dimmer intro, with a gentler vibe, yet still pleasant, in its own way and utilising lighter small percussion. It soon brightens up, though, with a happier chorus. Somehow, it carries a folky feel and a gentle simplicity, which really make it what it is – a cheery track, completely free of pretension and building confidence and height, as it goes along. Nice quick touch on the closing riffs). Cold December – Notably Green Day-esque intro, so clear, you can almost see them jumping around, in that free, punky way, as they play. Very bright vibe to this, very catchy and so summery and just filled with fun sounds, all the way through. There’s nothing else to say. You’ve just got to love it. Peace Of Mind – Opening with a single chord, fading into a more melancholic sound, through which, the lyrical meaning is audible. A definite sorrow infuses it, yet the resultant strength comes through, too. What this track does is relates the mental processes of the song’s theme, in stages, as the tension and release builds, throughout it and especially towards the end. It’s ultimately, a thought-provoking piece. The Nerve – Crushing sense to that intro, in a demonstration of suffocation. It’s actually like a narrative form, as the track progresses, through which, you can sense the life lessons recounted and the breakthrough achieved through them. Amongst all that, though, the bluesy licks progress and speed up, with the hedonistic drum sections and heightened riff pitches, to create a full-bodied, involving listen, lifting your mood and adding flavour and atmosphere. Building, to a fabulous crescendo, it ends on a massively bluesy finale, rocking it to the core. If ever there was a crowd-pleasing closer, that’s it. Overall – ‘FTWM’ is a pleasant surprise, filled with colour and life, with a bluesy edge and an intriguing variety of sounds and genre twists. Purists may struggle to grasp its concepts, but for the more eclectic listener, there are treats galore. Good party piece. For fans of Brit rock, NWOBHM, punk, folk and blues. 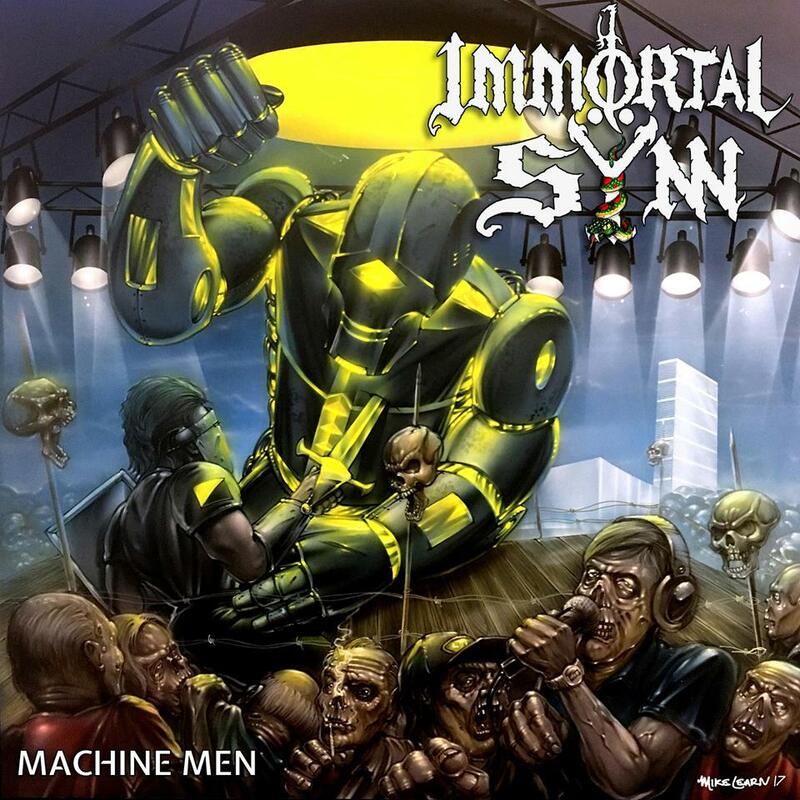 A 5 piece heavy-metal band, from Denver, Colorado, Immortal Synn combine traditional and NWOBHM, adding their own twists. Inspired by old school bands like Exodus, Megadeth, Judas Priest and Motorhead, I.S. were founded in 2004, by lead guitarist and sole original member Tony Z. Following a bad phase of chaos and substandard recording, the band was put on hold and Tony joined Phoenix Rising (later known as Wild Angelz and then, Devoutcast), in May 2007. In July 2012, just as Devoutcast was about to implode, I.S. was resurrected, with Devoutcast’s vocalist Alex Kiebler recording their demo single, ‘Whiskey’, in March 2013. Becoming an immediate success, the track secured airplay on numerous radio shows, including ‘The Friday Night Feature’. In 2015, an entirely new band line-up was born and around that time, I.S.’s demo EP, ‘Barfly’ was released, with new vocalist Chase McClellan. ‘Whiskey’ also featured on it, as did the initial recorded cover of Pantera’s ‘We’ll Meet Again’. The following year, the band launched a cover of The Chainsmoker’s ‘Don’t Let Me Down’, via youtube and itunes, to relative success. Their 1st album, ‘Machine Men’, emerged in August 2017. Evolving, from the earlier hard rock sound, exploring thrash and traditional metal arenas, I.S. suddenly shot to fame, that same month, as a consequence of Tony Z’s highly publicised attendance at the Denver-based Taylor Swift trial. I.S. are aiming to bring the old school sound to the world and also plan to tour the US this year and Europe in the summer. Liberty Rising – Rising drums intro, with a sharp as hell riff and a furiously fast speed section, with a Celtic edge and top-notch sound. To say this is energised and electrifying is an understatement. Breath-taking quality, right from the start and it never lets up. This is an extraordinarily uplifting, skilled and perfected track, displaying a brand-new acuity to a highly modernised version of melodic speed, power and thrash combined, with a massive emphasis on the power element. It’s vividly colourful stuff, of the highest vibe imaginable. I want more. Metal And Blood – Startling riffage opening, with wolf-like vocals, in an Alice Cooper-esque vein. The immensity of strength in there is just mind blowing. Truly. Bow down in worship, to the gods of metal. Incredible fretwork going on there and such astonishing vocals. If anyone believes what they’re singing, it’s this guy and the absolute throat shredding, razor-tipped power with which he sings it is genuinely jaw-dropping. A legendary sound altogether. Need convincing of the existence of metal sincerity? Look no further than I.S. Dark Abyss – More of that astounding riffage and an even faster pace, with a decent vibrato section combines with megalithic drumming, to form a crackly energetic speed track, that’ll leave you speechless. These guys are in another league altogether. ‘D.A’ is a stratospheric example of that. Intensity fuelled metal mania. Strength – Clicking drum sticks intro, in a style not heard, as standard. Opening onto an explosion of metal, which can only be described as controlled abandon, there’s a lively exploration of pace, tempo and style, keeping you on your toes at all times. Some magnificent shades in that totemic riffing and the life in every aspect of performance just throbs with gigantically powerful force. Immense feat of delivery. Hatred Nation – Bang! Action packed explosive life force, conveying a darker sense, through light filled shadows and sheer energy. Injecting an Eastern sound, into the riffs, as it fires on to the end, there’s a real tightness and pointed precision to the whole instrumentals, which is enough, in itself, to impress. Just full on, gold level metal. The Dark Of Dawn – High octane power intro, bringing together all accompaniments, in a shining rendition. Thrashier vocals here, burning riffs leading into melody, interlacing with the darker, heavier elements and penetrating your soul, with that magical riffage, that sings, through your veins, till the heavier section closes it. Almost spiritual, in its expression of creative release. Outstanding. Blind Soul – Crackling fire intro’s, into a Bono-esque emotional, gravel filled ballad-like gentle, rockier focused track of pure beauty. Incorporating some occasional harsh death growls, increasing as the song goes on, melody takes the central role here and it’s simply beautiful. A perfect wildcard, demonstrating complete musical dexterity and versatility. Novus Ordo Sectorum – Blitzing onto the scene, with a fireball of energy, it’s classic thrash, with anthemic choirs, to boot. Getting heavier, during the interspersed thrashy sections, there’s a world of power and metal intent in this track alone. Again, those guitars sing, with infectious melody, fading out, as they do. Beyond catchy, this is heart invading stuff. Above The Law – Perfection already! That intro is so precise, it leaves no room for anything less. Heightened screams, as death tinged thrash takes over, in a powerhouse of vibrato infused metallic joy. Anthemic vocals make it a hotbed of molten metal, as the full range of vocal gymnastics of which I.S. are capable comes to light. A shooting star of metal ecstasy. Fringes Of Society – Drumming extravaganza intro’s. Sleaze vocals appear now. The sheer scope within those pipes is spectacularly impressive. Loving the echoes the guitar leaves behind. Savatage-esque ‘White Witch’ type riffs enter now and there’s an undeniable might about them. Hugely melodic and so vibrant, it was only fitting for the song to end on those same heart-stealing riffs. Machine Men – Gorgeous, ‘Civil War’-esque riff intro, joined by more of those beautifully gritty vocals. A Bon Jovi edge lingers within that voice, too and it’s really fitting for a more emotional song of this nature. Deeply catchy and thrumming with life force, that velvet sound slides right down, into your soul. Guitar led and driven, throwing in a news broadcast oration, as the towering riffs build, climbing higher, with the vocal pitch of the broadcaster, the melody becomes the song. Ending on a fighting, battle-esque riff section, it’s a great end to a great album. Overall – I’m lost for words as to the enormity of ‘Machine Men’ and its exceptional nature and magnitude. Its versatility alone is incredible. Capably moving throughout a range of styles and genres, including heavy-metal, thrash, speed, power, sleaze, hard rock, soft rock, death, melodic and everything in between, demonstrating unfailing, gargantuan power, within each, ‘M.M’. is a rare exception to the familiar sound of standard metal albums. It’s sheer volume and flawless production speaks for itself. I.S. are a mountainous talent and ‘M.M’. is the peak. For fans of Savatage, Slayer, Alice Cooper, G’N’R’, Bon Jovi, Kickin’ Valentina, Slash, Duff Mckagan’s Loaded, Bono, WASP, Warrant, Testament, Megadeth, Reign Of Fury. 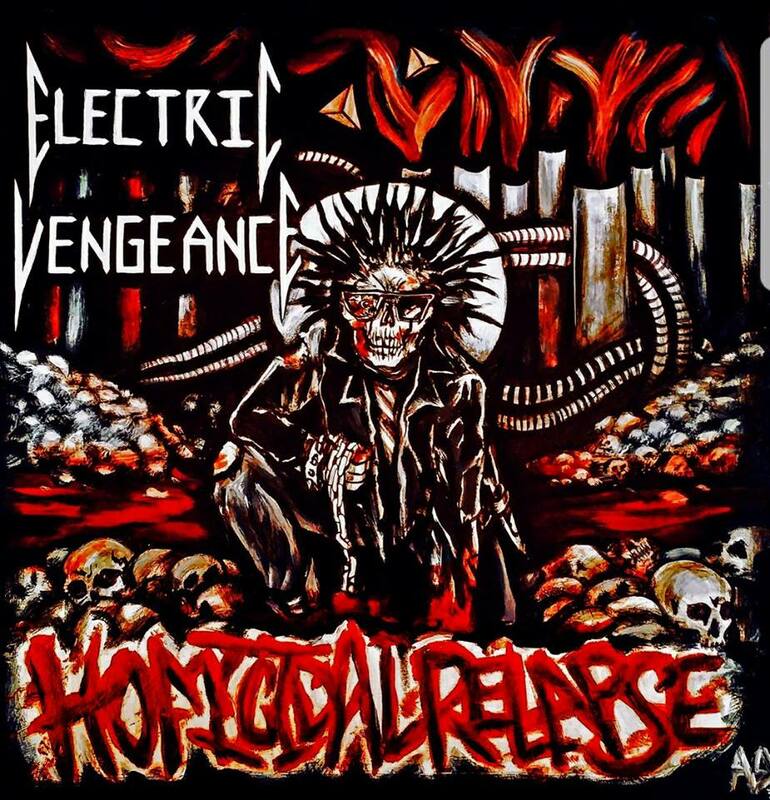 A trio of determined old school metallers, committed to bring back the true sound of heavy thrash and punk metal, Electric Vengeance hail from Dallas, Texas and united in June 2007. Sworn to avenge the injustice of mainstream neglect and marketing violation of metal, they’re the Devil-horned, superhero, Batman equivalent of Metaldom. Their very own ‘Street Metal’ genre combines killer riffs and ferocious vocals, with insane drumming and pounding bass, throwing in metal attitude and wry, obscure humour, for good measure. E.V.’s underground following is rising and renowned for its moniker, ‘Street Metal Attack’ and the associated slogan, ‘Keep It Electric – Kill To Win’. ‘Homicidal Relapse’ is their 2nd album, released on October 27th, 2017. Street Metal Attack – Slight delay, before the full throttle metal attack begins. It’s an all-out feast of steel, with truly punky lyrics and an air of plausible sincerity. Classic shredding, upbeat vibes, whilst still keeping it real, with raw feeling, resonant lyrics and great, well placed backing harmonies. 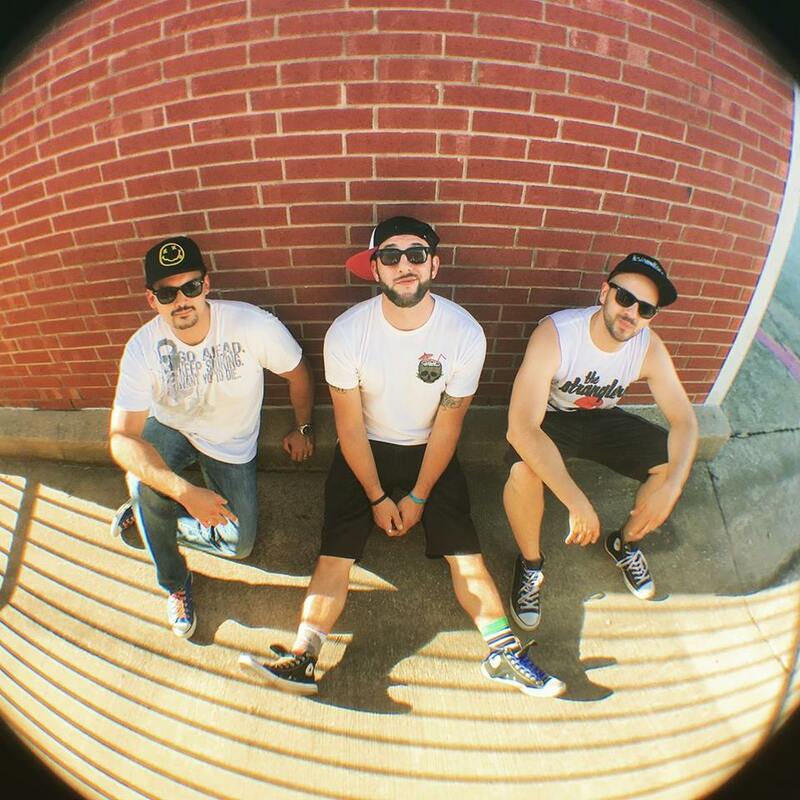 Ably handled drums and bass lines, complete cohesion and a massively catchy, stand out sound. Electric Vengeance know their stuff and that’s clear, from the off. Homicidal Relapse – Instant high-class riff intro, showing its shredding chops and the huge band synchronicity immediately. Everything complements each other and some fun, Slayer-esque riffs do their thing, as the drum rhythm and vocal timing slots in perfectly, with sheer precision. It’s uplifting, fresh and confident, leaving you with equal confidence in the band. A lively and united sound. Street Urchin – Drum beats intro, with a rolling rhythm, giving way to a punky track, with echoes of Anthrax’s ‘N.F.L.’, combined with D.R.I.’s ‘Beneath The Wheel’ and Municipal Waste’s ‘The Art Of Partying’. The vocal harmonies add just enough force and the rolling sounds are ideally placed, for best effect. Very brief, but powerful and drum focused. Bad Boys In Body Bags – Hard-hitting riff opens, with immediate impact. Similar echoes to ‘Street Urchin’, but impressive ease of delivery. Some great melodic riffing, expertly timed rhythms and it’s a track in which, the repetition serves it well. Liking that strategically placed bass section, at the close, adding the perfect finish. It’s memorability’s its outstanding feature, enhanced by the catchy chorus. Gunfight – Mechanical sounds introing, with an exclamation of despair, before the metal takes over, in all its catchiness. A really fun, enjoyable party metal piece. Probably its U.S.P. A definite crowd-pleaser, if nothing else. Short, but very sweet. Ending on a brief acoustic part, this is likely to be the most requested track of all. 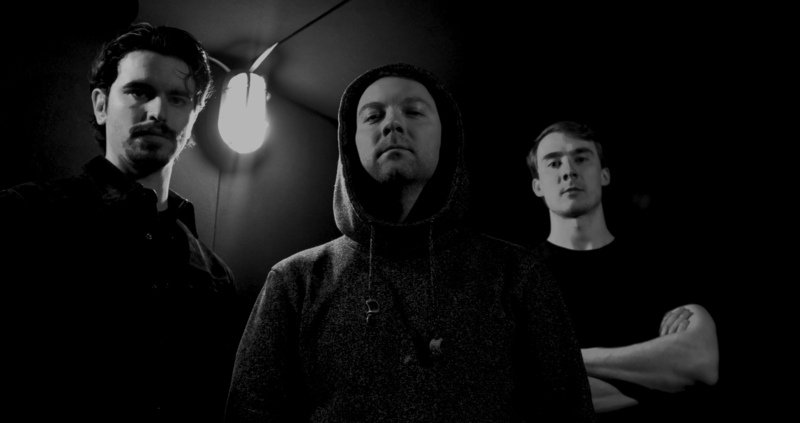 Brackish – Voluble, striking riffage opening. Speed shredding takes the stage, as the accompaniments unite, to form a popular front, with a heavy alliance. Power metal becomes the driving force here and it works stunningly well. Huge, fast-paced melody’s the name of the game and you’ll just want more. Addictive, charismatic stuff, in spades. Ouija At Witching Hour – Another banging, but darker riff intro’s, moving, with total fluidity, into an equally dark and sinister lyrical theme. Performed with equal parts light and shade, some cleverly arranged bass moves bring an even darker edge. A lighter melodic section takes its rightful place, as the sheer accomplished craftsmanship becomes apparent. Flawless, effortless ease brings it to a classic, Metallica-esque ending, consolidating the delight. Just superb. Beaten To Death For Exercise – An oration opens, with the most sinister words. So utterly convincing, you’ll feel relieved when the metal comes in. Fast, frenetic pace, rhythmically attuned to match the lyrics and in no time, it returns to the scary murderous psychopath, reciting his crimes, in a chillingly calm tone. Nightmare fodder right here. Keep It Electric – Cymbals intro, onto a thoroughly metallic section, much like Metallica’s ‘Kill ‘Em All’ sound. Just an all-out metal Fest, with all the best ingredients for metal success. Power shredding, speeding drum beats, steady, but inventive bass, killer melodies and vocals filled with conviction. ‘K I.E.’ is in fact, a recipe for doing just that. (If you don’t count the obscure horn, at the end). Overall – A faultless, fun and fevered performance, from start to finish. ‘Homicidal Relapse’ is a straight up metal assault, both massively listenable and totally believable. One to return to again and again, it easily belongs in the top 10 metal albums of the year. Buy it now. 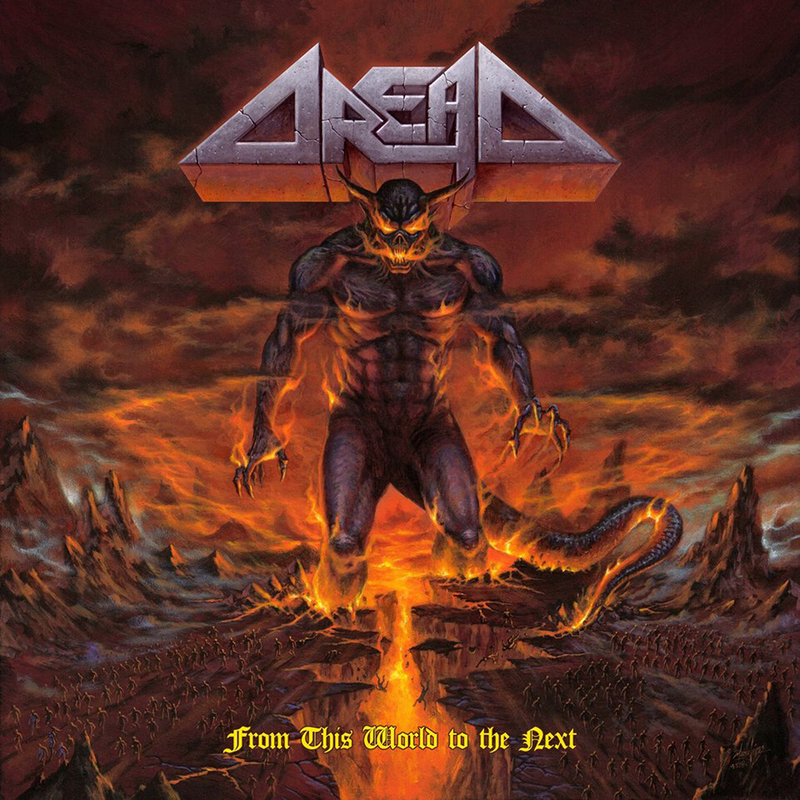 Seven tracks of catchy, trad, melodic metal, ‘From This World To The Next’ is the first album Dread have made in 8 years. As such, it has all you could want. Produced by Taylor Young (NAILS, Twitching Tongues), at The Pit Studios, Van Nuys, California. Mixed and mastered by Arthur Rizk (Power Trip, Cavalera Conspiracy, Eternal Champion, Summerlands). 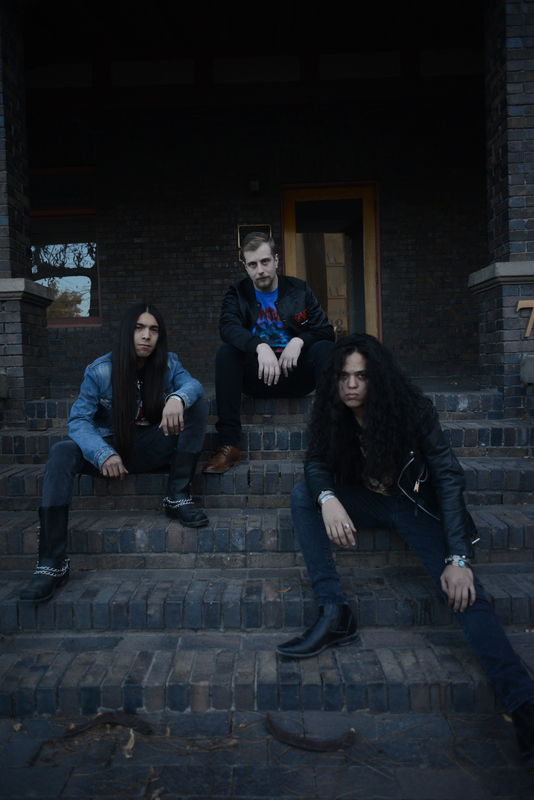 From Albuquerque, N.M., currently of L.A., Dread (Taylor Dread – vocals, A.D. Camarena – lead guitar, Vinny G. – also lead guitar, Carlos Guitierrez – live drums and Bobby Sins – live bass) are inspired by such bands as Judas Priest, Iron Maiden and Armored Saint). Their mission is to bring back the old school metal sound, with a few additional inspired riffs. They’ve so far played alongside Exciter, Enforcer, Fuelled By Fire and Havok and Dread are a sensational live act, with an unforgettable presence. Blitzkrieg From Hell – Gorgeous reverb bass led riff intro, gradually fading in, with a memorable wobble section, suddenly taken over by loud, raw metallic drive. The timing’s slightly out and the background, a bit tinny, but the flavour’s still there and the passion audible. Nice bit of vibrato, towards the end and it’s nothing, if not colourful. Redemption Lies – Far more explosive! Positively warlike sound, of marching, beating drums and an air of lively excitement. The vocals do sound a bit far away and again, there’s a slight tinniness, though less pronounced here. The drums really hold all the power and take it forward, with the riffs upping their game and increasing the volume, approximately 3/4 in. That’s when the melody hits hardest. Closed by the riffs, there’s a sense of the guitars struggling to be heard, over the rest and the general noise distortion, but it’s still driven and it seems, the best is yet to come. Tyrants Of Demise – Another explosive drum intro, the melody could do with more clarity, as it’s drowned out, by those distorted levels, but you can hear the potential and the effort being invested. In this case, the rhythm’s better timed and there’s a more cohesive sound, culminating in a notably stronger finish. A lingering hope follows. 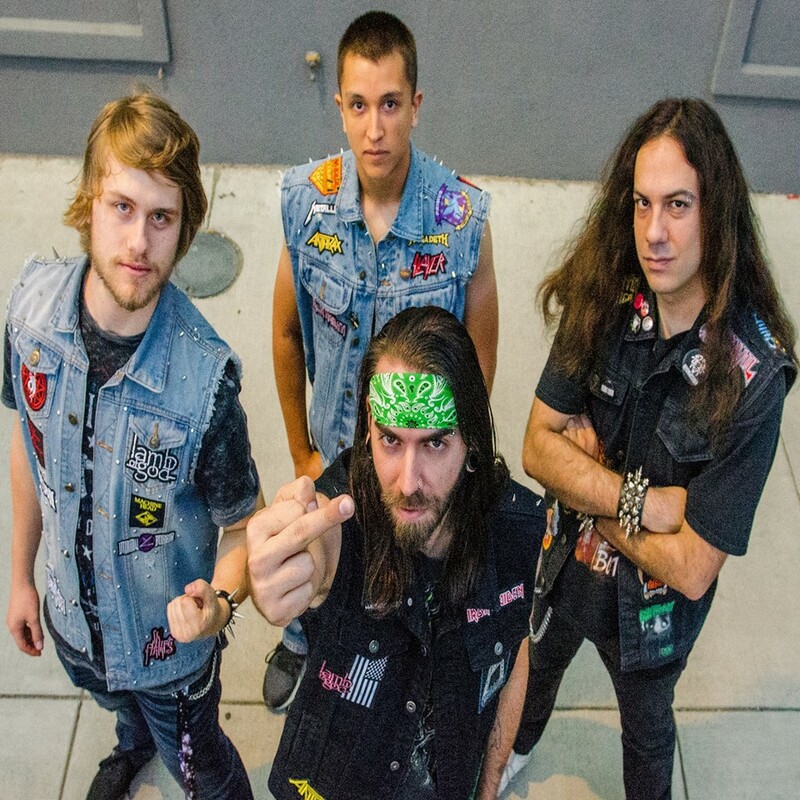 Lost Souls Ave – Single, mighty drum hit opens, followed by strikingly more powerful, Enforcer type screams and sudden strength entering the vocals. From that point on, the melody grows and the power screams with it. Now, the sound’s improved and this is definitely much more like it! Whatever secret ingredient’s been added here, it works and needs to stay. So much better and now, Dread’s real capabilities are audible). Ending on a standard, but lively riff, this is the best track yet. The Sleep Of Last Breath – Real power introing, the drums and riffs finally connecting. Now, that classic vibe shows itself and though the tinniness is creeping back in again, there’s just more power and a bigger overall sound, saving its credentials. A racing pace leads into another section, with evidently greater power and propulsion, even if you can hear the band fighting for volume, again, over the background sound and production levels, at times. It does grow louder and heavier, though, so they do win out in the end. Towards the end, the pace is rushed, somewhat, but it’s a sterling effort, deserving of praise, in itself. From This World To The Next – Cymbals intro, with a much classier riff and drum section, leading, naturally, into a melodic vocal, bringing the hooks and catch with it. Here, rightly so, for the title track, is where the point of greatest cohesion and anthemic warmth enters and with it, the catchiest sound yet. Performed with sincerity and noticeable passion, this ending is impressive and conveys real positive emotion. Until Again – Beautiful, resonant riff intro, opening onto some truly plausible, profound vocals. Adding another new thread altogether, of poignancy, so palpable, it lifts the whole song. Soaring higher, with the suddenly extraordinarily delivered accompaniments, at that moment, there’s instantaneous synchronised cohesive connection, which is how it ends. Worth waiting for, for that ending alone. Overall – It may have had a bit of a shaky start, but I’m pleased to say that ‘FTWTTN’ gradually moves in the right direction, growing in strength, till it’s movingly powerful end. Yes, the production and specifically, the levels, could do with a bit of work, especially earlier on, but the passion’s always there and everything culminates, in the most remarkable way, for that emotionally intense finish and that’s its highest point and it’s obvious driving force. Ultimately, it ends better than it started and bearing with it will pay dividends. It takes its time, but rewards you, in the end. 7/10 ******* (tracks 1-3). 8/10 ******** (tracks 4-7). For fans of classic, old school metal, metal ballads and particularly, Iron Maiden’s ‘Brave New World’ era. From Montréal, 3 piece WYKAN were formed in 2017, by Eohum guitarist/singer, Jeremy Perkins. 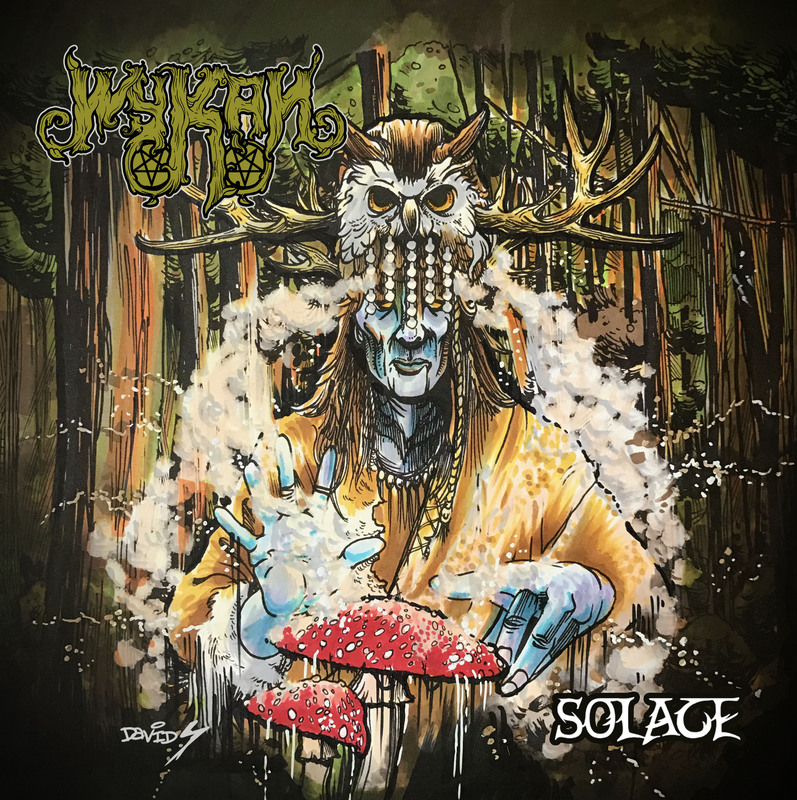 Combining stoner, psychedelic rock and blues, with a hint of black metal, WYKAN produce a riff heavy sound, exploring the limitless avenues within that arena. Featuring special guests Matt McGachy (Cryptopsy) and Barrie Butler (Eohum), the debut EP ‘Solace’ is based around Ethnobotany, magic and tribal interpretations of ceremonial rituals. These originate from the Saami (Northern European tribes) of Scandinavia and their Shamanic practice of using Amanita Muscaria Mushrooms. The main aim of ‘Solace’ is to bring forward the stark contrasts between our world and that of the spirit world. Jeremy Perkins states that WYKAN, for him, marked a return to blues, doom and emotive music, following 3 years with black metal band Eohum. Morgan Zwicker (drums) and Daniel Paras (bass) both bring specific jazz and blues skills and experience to the project. Self released on 13th April 2018, ‘Solace’ features the debut single, ‘Lahppon Olmmos’ (Noaide’s Ride To Salvo), which associated video can be accessed via YouTube. Lahppon Olmmos – Very Native American intro, depicting a traditional cultural ritual, easing from there, into a heavy bluesy guitar break. Real vocal grit and pounding bass add layers of effect, as do the variations. Throwing in some blackened death growls and pace alternations, before resuming the blues angle, it’s a great blend of techniques, with many cultural roots. The drums are, for the most part, tribal, as you’d expect for such an eclectic track. Gradual fade-out, leaving the blues imprint behind. The Gathering – Strong steel stringed riff intro, with a much gentler tone and flow. Somehow, it now moves into another black metal vocal, whilst keeping that quiescent accompaniment going and convincingly so. It does grow heavier, in places, but the overall rhythm’s still laid-back, in comparison. That’s quite some skill to master. Some notable fiddly paradiddles make their way in there aswell. The mood drops down, almost imperceptibly, for the briefest moment, before returning to a higher vibe, but then drops back down again, at the end. Experimental and highly, uniquely intriguing. WYKAN – Rain intro, with sounds of the wild adding realism. A brief, but profound spoken section, before moving into a deep and melancholic instrumental. This is thought-provoking stuff. Growing in power and volume, rolling towards you, gathering strength, like a wrecking ball, it suddenly changes direction, into harder, death soaked territory, but simultaneously, keeping that intermittent contemplative thread going. Eventually, the blackened sound takes over, as it reaches the end. A true genre hopping work of edgy variations. Overall – Impressively eclectic, undefined by any one genre, with a healthy disregard for boundaries, ‘Solace’ could easily be called a cutting-edge production, traversing many genres and perceived barriers, within metal. Less of an EP to enjoy and kick back with and more one to concentrate your thoughts on, perhaps, but otherwise, it’s intelligently thought provocative, with touches of genius. For fans of Cherokii, Carcass, Satarial, Lynyrd Skynyrd, grunge rock, southern blues rock and everything in between. https://youtu.be/w9kA4p7zY7Y (video for ‘Lahppon Olmmos’).